Ever since Kindle announced the ability to loan Kindle edition books between accounts, sites started popping up to help readers connect and share ebooks. The way it worked was they you'd sign up (for free) and let people know what books you wanted to read and which books you had available. Then some email swapping would be done and you could go to Amazon and loan out your book. 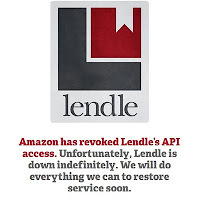 Today, one of those sites, Lendle, has closed with the message: "Amazon has revoked Lendle’s API access. 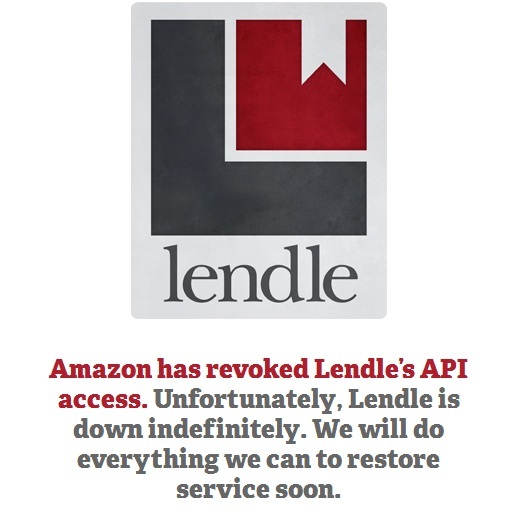 Unfortunately, Lendle is down indefinitely. We will do everything we can to restore service soon." I've asked the site owners for a little more info, but haven't heard back yet. I know Amazon are pretty tough about using Kindle in a website name but this isn't the case here. Booklending.com, for example, was once named Kindle Lending, and had to change. What it will mean for people getting together and trading email addresses for book swaps, I don't know. Amazon can't monitor every forum out there on the net, and I don't see how swapping with an online friend would be deemed against the rules. Lending is still alive and well. But we'll see what happens with sites that link up lenders and borrowers for bookswaps.